"[America] has developed along the material rather than the immaterial, the concrete rather than the divine." The American artist and collector Katherine Dreier championed modern, avant-garde art in the United States starting in the 1920s when such art was regularly decried as abject, inscrutable, a hoax. While academically trained as a painter, Dreier was one of the first Americans to embrace the modern art that was being made in Europe by the likes of the Post-Impressionists, German Expressionists, and Constructivists. Deeply influenced by the spiritual and theosophical writings of Wassily Kandinsky, Dreier proselytized the spiritual rejuvenation offered by these approaches to art. Along with the Dadaists Marcel Duchamp and Man Ray, Dreier co-founded the Société Anonyme, a radical group of artists that sought to disseminate a diverse art to the masses through exhibitions and lectures. Through her own paintings as well as her collecting habits, Dreier was an important force in popularizing modernism in the United States. As a painter, Dreier synthesized the lessons of van Gogh and Kandinsky to create a highly personalized art that aimed to reflect the inner spirit. Moving between representational and abstract styles, Dreier combined color and form in bold ways for expressive ends. A believer of Theosophy, a religion built on mystical and occult philosophies that flourished at the turn of the 20th century, Dreier had faith in the power of art to prod humanity's evolution to a higher spiritual awareness. Inspired by Wassily Kandinsky's own writings on the spirituality of art, Dreier incorporated the symbolic shapes and colors laid out by Kandinsky to convey the cosmic and transcendental meaning of her subjects. While Dreier painted throughout her life, her mission to collect modern art and educate the larger American public on its significance took up most of her energies. Through the Société Anonyme, Dreier curated numerous exhibitions and delivered countless lectures to introduce and demystify the new, avant-garde painting and sculpture. She was adamant that it was through living with the art and experiencing it that one could come to understand and appreciate it. Katherine Sophie Dreier was born into a fairly wealthy family in Brooklyn, New York. Her parents emigrated from Bremen, Germany in the 1850s during one of the largest flows of German immigration to the USA, and soon established a comfortable environment for themselves and five children. Theodor, Dreier's father, earned a substantial salary in an iron importing business. It is clear from several accounts that the Dreier home was a warm and progressive one and that Dreier and her siblings enjoyed the same opportunities independently of their gender and were also encouraged to understand and participate in social endeavors from an early age. Indeed, throughout their life, and following the example of their mother, Dorothea, all of Dreier's siblings and especially her three sisters, would exhibit an active commitment to social reform. 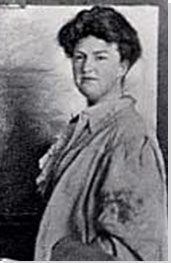 Her sisters Mary and Margaret made significant contributions to the suffrage and labor movements, holding leadership positions in the Women's Trade Union League (WTUL) among other organizations. While Katherine was to follow in the steps of her older sister Dorothea, a Post-Impressionist painter, and become an artist, she herself engaged in social work throughout her life. 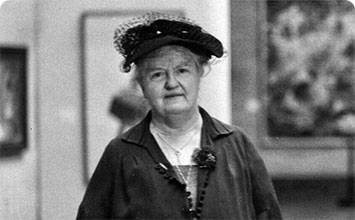 Her approach to art and, later, collecting also reflected her commitment to democratic ideals. Dreier's Landscape with Figures in Woods - previously known as The Avenue, Holland - was one of two paintings exhibited by the artist at the New York Armory Show in 1913. A raised path, lined with trees, curves through the center of the composition, and several solitary individuals walk along it. Painted in lush greens and blues and warm earth colors, the scene embodies the quiet grandeur of the landscape. The subject-matter of the painting - a view which must have captured her attention during her trip in Holland earlier that year - is, as it is often pointed out, quite conventional, reflecting her early academic training. Borrowing from Impressionist and Post-Impressionist styles, Dreier aims less at an objective representation of the scene than an expressive rendering of it. Thus, while Landscape with Figures in Woods does not in any way prepare the viewer for the leap into abstraction that Dreier would soon take, it can be said that she, following van Gogh whose work she very much admired, was already a proponent of a highly personal art. While Landscape with Figures in Woods was not remarked upon when it was in the Armory Show, when it was shown a second time at Macbeth Gallery, it garnered a number of positive reviews, including one from the New York Times. "Although sufficiently conventional in subject, [it] is put together with definite attention to the division of the space into ample and agreeable minor spaces. ...notable chiefly for this tact in the disposition of the lines and masses, [it has an] ability to speak the decorator's proper language with force enough to be heard at a distance." Painted in 1918, Portrait of Marcel Duchamp attests to the thorough transformation that Dreier's art underwent in the years following the Armory Show. Eschewing the traditional representational nature of her earlier work, Dreier renders her dear friend in an abstract, non-figurative manner. Rich yellows, blues, reds, and violets combine with triangles, circles, and other shapes to create a cacophonous composition. One searches the painting for some clues to Duchamp's identity, and perhaps one sees the letter D in the center and a pipe at center-left. Dreier, though, was not necessarily interested in these likenesses, instead she wanted to portray Duchamp's inner life. Of this painting, Dreier wrote, "[T]hrough the balances of curves, angles, and squares, through broken or straight lines, or harmoniously flowing ones, through color harmony or discord, through vibrant or subdued tones, cold or warm, there arises a representation of the character which suggests clearly the person in question, and brings more pleasure to those you understand, than would an ordinary portrait representing only the figure and face." The work celebrates Duchamp, who, in Dreier's eyes, combined "originality of so high a grade" with "such a strength of character and spiritual sensitiveness," but its style owes much to another of Dreier's favored artists - the Russian abstractionist Wassily Kandinsky. While studying in Germany in 1912, Dreier read Kandinsky's On the Spiritual in Art and was inspired both by his view of "form as the outward expression of inner spiritual meaning" and by his synthesis of form and color. The two also shared an interest in the non-traditional, occult religion of Theosophy and the writings of Rudolph Steiner. The art historian Francis Naumann points out that in Kandinsky's treatise, the triangle suggests mystical enlightenment. The prominence of triangles in the composition suggest that Dreier saw him as an enlightened individual. She said of him, "I have always considered [Duchamp] one of the most advanced spirits of our Time," and Dreier once said, "and though I did not always understand what he was doing I was intuitive enough to let Time reveal it to me." In the same year as completing the abstract portrait, Dreier commissioned Duchamp to produce a painting to hang above the bookshelves of her Manhattan apartment. The resulting work, Tu m', was to be Duchamp's last painting on canvas. If Dreier's Abstract Portrait of Marcel Duchamp simultaneously exhibits her facility with abstraction, her Waterfall of 1931 serves as a reminder "of the range of her style and the character of her contribution to the modern movement," as the 1952 Yale catalogue of the Société Anonyme's collection describes. Incorporating her love for rural landscapes as well as abstract elements, the work resists straight-forward, stylistic categorization. Whether the painting represents a real waterfall or an imagined one is also not clear, as there is very little art-historical research surrounding the work. The idea to paint a waterfall could have been the result of seeing other works with the same subject, such as Kandinsky's Waterfall of 1909 or Shining Waters of 1920 by Louis M. Eilshemius, whose work Duchamp very much admired. Dreier's image, however, is not the product of a simple act of imitation but constitutes, rather, an individual expression borrowing elements from a variety of sources. The painted spheres at the top-right corner of the image can be read in relation to Kandinsky's understanding of the circle as an elementary form which "combines the concentric and the excentric in a single form, and in balance" and which has cosmic significance. Unlike Kandinsky, though, Dreier combines these mystical forms with a natural landscape. Dreier's waterfall could, finally, also have something to do with a need to give expression to her beliefs on art - heavily influenced by her Theosophical upbringing - and to the metaphor of water that she often employed in speaking about the subject: "The stream of art flows on," she wrote in 1948, "and must be constantly renewed by fresh waters not to become stagnant." Whilst renting a studio on Place Dauphine in Paris during the 1930s, Katherine Dreier developed a series of lithographs, reproduced and published in 1937. Titled 40 Variations, this vibrant set of abstract images intended to capture musical experience in visual composition. "During 1933 two things were happening over here which greatly intrigued my imagination!," explained Dreier in her introduction to the series. "The first of these was the playing of Beethoven's Variations at many a concert during the winter months, and the other was the International Regatta during some of our most perfect summer days. Both events made a deep impression, and there flashed on my mind the query - why not translate these two experiences into the realm of abstract art?" While Dreier acknowledged specific musical works as a source of inspiration for her Variations, music had played an important role in the way that Kandinsky understood and wrote about art. Using an elementary drawing as her foundation, Dreier introduced variation by a combination of hand-coloring and stenciling - a complicated printing process overseen by Duchamp - limiting herself to a palette of four colors: red, blue, yellow, and umber. The variation of colors attests to the significance of Kandinsky's work for Dreier. "Color," he wrote in Concerning the Spiritual in Art (1911), "is a power which directly influences the soul. Color is the keyboard, the eyes are the hammers, the soul is the piano with many strings. The artist is the hand which plays, touching one key or another, to cause vibrations in the soul." The purpose of great works of art, Kandinsky further argued, is to "'key [the soul] up,' so to speak, to a certain height, as a tuning-key the strings of a musical instrument." Finally, while the different images in the series have the capacity to produce an effect of their own, as Moholy-Nagy revealed in his introduction to the edition, the value of examining these images side by side should not be underestimated. "The pages," he wrote, "miraculously transform themselves into a rapid movement, into a fluctuating pattern of fighting discords, strange harmony, an overwhelming surprise of sublime rhythms." Interestingly, this series by Dreier later served, as Claire Lui narrates, "as the basis for a dance piece, with choreography by Ted Shawn and music by Jess Meeker (and also for a line of silk fabrics, though no record of those fabrics remains)."